The casual fan of The Twilight Zone may not realize that creator and host Rod Serling also wrote a number of films throughout his too-short career. The most notable is likely Planet of the Apes, but there were several notable films he wrote that never entered the pop cultural lexicon in the same way that one did. Serling spent most of his career writing teleplays for TV dramas, but here are a trio of theatrical feature films penned by the legendary TV persona. 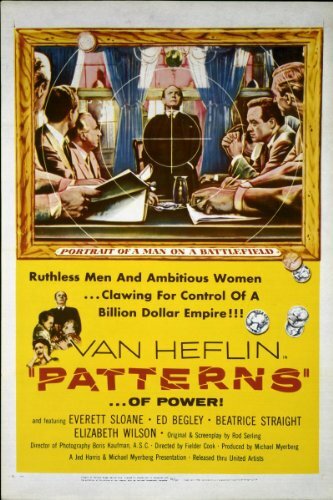 Patterns (1956), dir. Fielder Cook. There is a powerful social conscience that runs through many of the episodes of The Twilight Zone, and that same sensibility is on display here in Patterns, as well, but the execution leaves something to be desired. Fred Staples, a young executive, is plucked from a lower-level position and elevated to the board of a high-power corporation. But Fred is confronted with the idea that the cold, manipulative Mr. Ramsey recruited Fred in order to force out and replace the aging Bill Briggs, who was no longer a reliable vote for Ramsey's maneuvering. As Ramsey takes Fred under his wing, it becomes clear that success at this highest of levels requires total commitment to the company above all things — above family, above morality. It's not a bad screenplay, and there are a number of unpleasant truths that it seeks to confront, but it gets lost in the direction. Most of the movie is a badly-used Everett Sloane (Mr. Ramsey) just yelling constantly. It becomes tiresome. Requiem for a Heavyweight (1962), dir. Ralph Nelson. 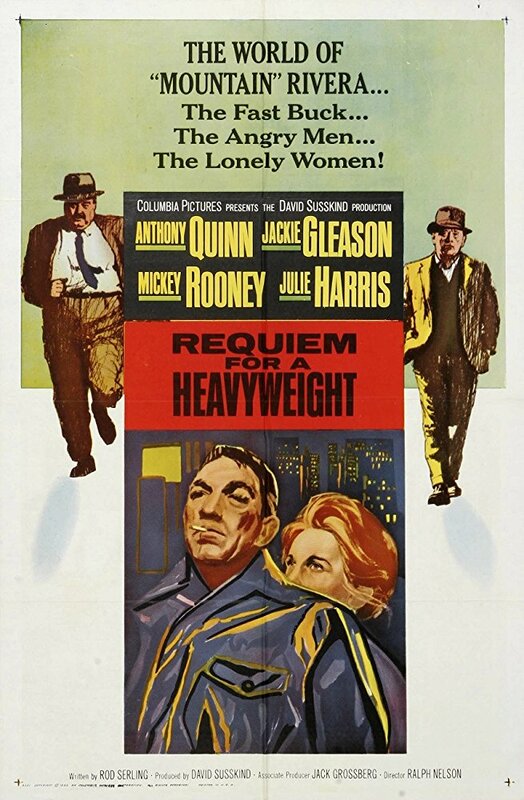 Anthony Quinn gives a stunning performance as a boxer who's taken way too many to the head and takes his life in his own hands if he chooses to fight again. The movie is Quinn's — Playing Mountain Rivera — struggle to find a life outside of the ring. He gets involved with Grace Miller, a social worker or career counselor, who tries to help him identify jobs that he could possibly land and find meaning in for a new chapter in his life. Quinn brings so much honesty and pain to this guy who's never been the smartest, and must face one of two futures whose outcomes are equally unknown — one in the ring where he risks death or paralysis, or one in the straight world. A brutal, moving film. Seven Days in May (1964), dir. John Frankenheimer. This movie presages the string of 70s paranoid thrillers that would emerge just a few years later. 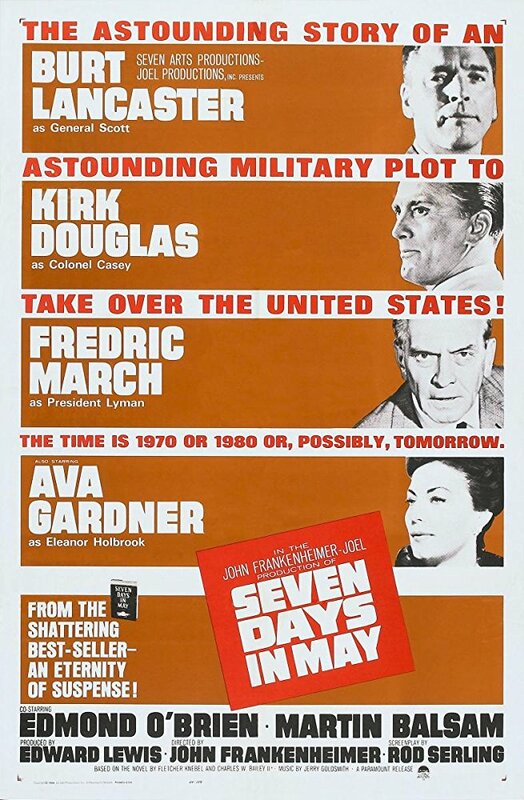 Director John Frankenheimer was just coming off of a masterpiece in The Manchurian Candidate, and just a couple of years from his way paranoid sci-fi-adjacent film Seconds, which is very good. 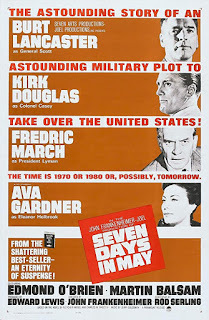 Seven Days in May feels very much of-a-piece with these other 1960s Frankenheimer films, and also feels very much anchored in Serling's respect for servicemen and distrust of those who would cavalierly send them to war. Colonel Jiggs Casey (Jiggs? I know...) gets little more than a hunch that something isn't quite right with an operation headed by his idol and mentor, General Scott, and begins digging. He quickly uncovers a number of threads that could be unconnected and lead to nothing more than usual Cold War secrecy, or to a plot to overthrow the President. It's a taught military thriller with a strong sense of human consequences and relationships. 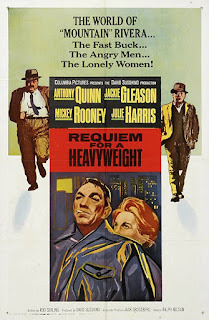 And a fantastic cast: Kirk Douglas, Burt Lancaster, Martin Balsam, John Houseman, Frederick March, Ava Gardner. You can't go wrong with this one. Posted by Vance K — cult film reviewer and co-editor of nerds of a feather, flock together since 2012. 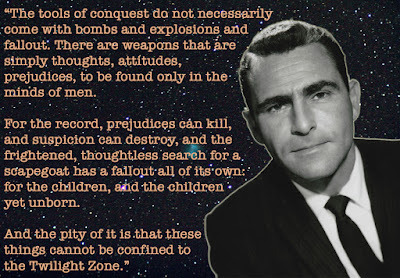 Rod Serling fan since probably the first time he saw television.